Auckland Castle has been the official residence of the Bishop of Durham for the past 900 years. Only ten miles from Durham, the heart of the Diocese, the castle has been extended every two hundred years since the original banqueting hall was built in the 12th Century. Each addition emphasises the role and position of the bishops in all aspects of life. Often without peers he would be the absolute ruler of the northern province on behalf of the King. 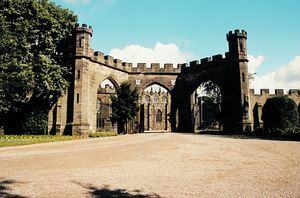 The glory of Auckland Castle is the magnificent chapel, reputed to be the largest private chapel in Europe. But if visitors look closer they will be able to identify one of the best examples of a medieval aisled hall in the north of England. Converted in the 17th century to its present use, it still serves the local community as well as the resident Bishop. The Castle contains many wonderful works of art, including Zurbaran's famous collection of pictures of Jacob and his twelve sons are to be found in the Long Dining Room. This is Britain's best exhibition of this 17th century Spanish artist and attracts visitors from all over the world. The elegant well proportioned walls of the Throne Room are adorned with portraits of the past residents of the Castle. Auckland Castle is now one of the most prestigious corporate hospitality and wedding venues in the north East and provides the perfect setting for a range of exclusive events. This unique venue is renowned for its quality of service, excellent cuisine and individual attention. Open every day, except Tuesday, from 10:30am to 4pm. There are Guided Tours starting at 11:30am and 2pm. The cafe is open from 11:30am to 3:30pm. Pre-booked tours can be taken for parties of 20 people or more (admission price subject to date & time of tour). When approaching from Durham on the A688 follow signs for Bishop Auckland town centre avoiding low bridge. Auckland Castle is just off the Market Place in the town of Bishop Auckland situated 10 miles south west of Durham and 8 miles from the A1.